• practical advice on how to foster creativity at an individual and an institutional level. The book will appeal to teachers, educational developers and institutional managers who want to enrich the higher-education experiences of their students and enable them to develop more of their potential. 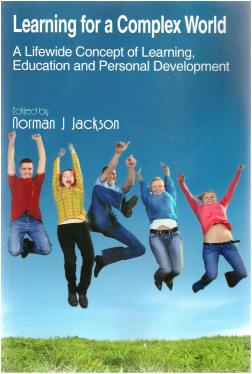 Although this book is not explicitly about students' creative development it is fundamentally bound up with the way they develop through the whole of their lifewide experiences. Students' higher education experience may span three or more years in their lifelong learning journey but during that time they will inhabit many different spaces on and off the campus. In these different spaces they develop relationships, encounter different sorts of challenges, seize or miss opportunities, aspire to live a useful, productive and fulfilled life and seek to achieve their ambitions. By adopting a lifewide approach to education a university can help students be more aware of the significant learning and development they are gaining through such experiences and help them make their education more complete and relevant to their future life. The book provides a rationale, underpinning philosophy, research base and practical examples of learning partnerships that enable lifewide learning to be recognised and valued by a university or college. It will appeal to anyone who is interested and involved in helping students maximise the learning and development they gain from their higher education experience, including their creative development. While the ideas and practices have been developed in a higher education setting they can be readily adapted to other educational contexts. The aim of this book is to make better sense of a long, complex, messy, change process through the stories of the people who were involved. Between 2009 and 2012, Southampton Solent University (UK) engaged in an unprecedented and highly complex strategic initiative which ran across the entire institution, its structures, processes and systems; it aimed to produce a fundamental shift in institutional culture. Such an all-embracing approach is rare in universities. Over fifty participants were interviewed during the course of the study and their uniquely personal perspectives have been woven into a compelling story of organisational change. Their perspectives and feelings will resonate with anyone who has tried to bring about significant change in a university. Universities are inherently creative places but too often there is a pervasive inertia that prevents ideas from being turned into new and better practices. This programme aimed to stimulate the creativity of staff and create an organisational culture of innovation. The book will be of particular interest to senior managers and anyone leading significant change or encouraging innovation in teaching and learning in a university. ‘Tackling the Wicked Challenge of Strategic Change: The story of how a university changed itself' is published by Authorhouse.